The unique design of the PureAir Series assures the long life and productivity. 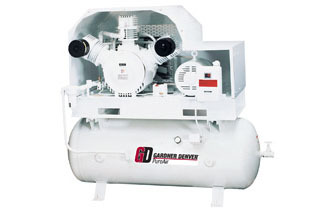 Our continuing program of product research and development assures that each Gardner Denver compressor includes the latest advancements in oil-less compressor technology. Internal moving parts in the PureAir Oil-Less design are protected from wear without conventional lubrication. Crankshaft and rod bearings are lubricated by exclusive sealed, solid synthetic lubricants. Pistons move on an alloyed heat-resistant filled Teflon guide and compression rings. The result is low maintenance, high durability and pure, oil-less air! Totally Dry Crankcase. Designed to maintain continuous operation. Finned to maximize efficient heat transfer. Large cover provides easy access to internal parts for service. Pistons. Patented design with "Iso-Temp" coating on top to isolate piston, rings, and connecting rod bearings from the full heat of compression provides exceptional thermal heat barrier for extended ring life - 10,000 hours or more! Valves. Plated valve plates and reeds of highest grade Swedish steel extend operating life and durability. Piston Rings. Designed for oil-less compressor service with three compression rings and two guide rings. Exclusive "O" ring pumper prevents axial movement of the guide rings and eliminates end wear. Formulated of filled PTFE material for long life and compatibility with the hardened nickel-plated, polished surface of the cylinder bore. Crankshaft. Cantilevered crankshaft design provides superior balance and long life. Air-cooled Aftercooler (Optional). Oversized, with ample reserve for cooling discharged air to within 5 - 10 degrees of ambient temperature. Enables air dryer to work at its highest efficiency. 100% Duty Cycle Operation. All models are rated for 100% continuous duty cycle at 100 PSIG for single-stage units and 175 PSIG for two-stage units. Cast-Iron Cylinders. Permanently nickel-plated and hardened to resist wear and corrosion, even under extreme operating conditions. Smooth bore, polished finish minimizes friction and reduces heat build-up for long ring wear life. Spring-isolated Base. Eliminates need for special foundations. Compressor and motor are mounted on a common inner base plate. This inner base is mounted on vibro-isolation springs to absorb all vibration. Meets NFPA guidelines for medical air compressors (Over-and under-unit configuration uses elastomeric vibro-isolators). Bearings. Long-lasting ball bearing design; 100% oil-less. 10,000 hour life on drive set bearings. 20,000 hours on main bearings. Deluxe Control Panel: Designed for Duplex, Triplex, and other multi-sequencing systems.